Love this TOMMY HILFIGER Girls Red Metallic Coat & Grey Dress for Spring Summer 2018. 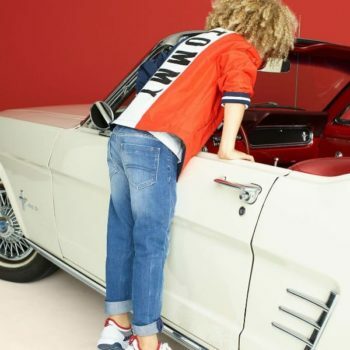 This super cool streetwear look for girls features an eye-catching red metallic coat with elasticated hood, cuffs, and hemline, decorated with the designer's iconic red, navy blue and white stripes, a logo on the sleeve and a bold white 'Tommy' print on the back. Looks perfect with this TOMMY HILFIGER Girls Grey Cotton Polo Dress.